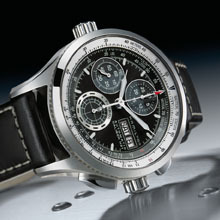 Biel July 2012 – For much of its history, Hamilton has found inspiration in the skies and has a long list of aviation timepieces in its product logbook. Propelling its pioneering aviation spirit to new heights in the year of the brand’s 120th anniversary is the dynamic Hamilton Khaki X-Patrol. This highly sophisticated chronograph integrates the new H21 caliber with its excellent accuracy and extended power reserve. 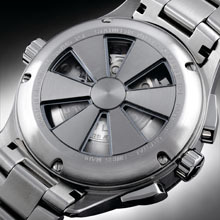 Equipping the wearer for today’s globally minded environment is a unique mechanical conversion facility to give accurate equivalents of a selection of units in either metric or imperial systems. In terms of styling and craftsmanship, this intricate timepiece visibly goes the extra mile with highly resistant modern materials and a keen eye for design detail. Hamilton has an aviation heritage dating back to 1919. That was the year in which a Hamilton aeronautical watch accompanied the very first American airmail postal service between Washington and New York. This elevated activity went from strength to strength and by the 1930s Hamilton was the official watch of the commercial airlines, TWA, Eastern, United and Northwest. A major highlight of the era was the selection of Hamilton as timekeeper for the United Air Lines inauguration of the first coast-to-coast service - a 15-hour 20-minute trip between New York and San Francisco. 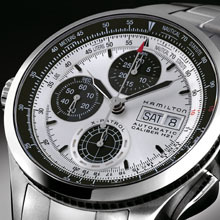 Today the Hamilton range includes various aviation-inspired watches. The brand is also timekeeper to a variety of international aviation events and has Nicolas Ivanoff, the leading French aerobatic pilot as its ambassador.